Upon resetting a FormGroup, I would expect the visual state of the form to be reset also. The form group and controls are reset but the mat-input-invalid class remains on the md-input-container suggesting that the control is invalid. This only seems to happen when the [formGroup] attribute is on a form tag. Works as expected on a div tag. Create component with a FormGroup and a FormControl with Validators.required . Create a form tag with the [formGroup] attribute. Add an input control to the form with a required attribute. When running, fill out the form so its valid, then reset the form and model through the click handler on a button. The required control will now have the mat-input-invalid class. Which versions of Angular, Material, OS, browsers are affected? @mmalerba trying to understand how this would fix the issue for a button already type="submit". I'm resetting after the form is submitted and a response has been received back from the server in an observable complete block. Not sure why, using resetForm() method fixed this issue for me. @mmalerba not sure i agree with your diagnosis. I am experiencing same issues and have only updated from material-beta2 to material-beta3. Main angular libraries remain unchanged and problem has only been introduced since material upgrade. It looks like this is just a matter of putting type="reset" on your button. Without it, the form is marked as submitted which causes the error styling to show up. after form is submitted, error styling should definitely be removed. I understand that a reset button works. 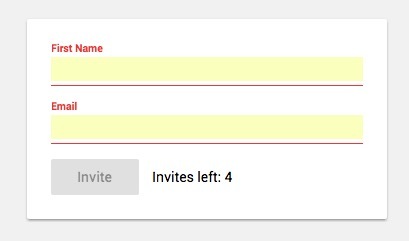 However, in my case I want to use a submit button, send the data to the backend server and then reset the form (so a new invite can be created). Unfortunately, resetting the FormGroup isn't enough. You'll need to reset the submitted state of the actual form. To do that, you need to get access to the FormGroupDirective which binds the FormGroup to the form and then call resetForm() instead of reset(). @mmalerba I don't think we can call a workaround a resolution. This still is not fixed. Why can't the FormGroup.reset() method use the FormGroupDirective to clear the submitted state of the form element? @mmalerba the hacky workaround is just to manually remove .mat-input-invalid on submission. If that's the desired approach, we should put it into the docs as it's a fairly straightforward way to address what should be a common problem for a reusable form that is reset on submission (that from my perspective isn't an expected or obvious output). On Wed, Jun 21, 2017 at 12:01 PM, mmalerba ***@***. ***> wrote: @Nathan-Ryan <https://github.com/nathan-ryan> The FormGroup and FormGroupDirective are part of angular core, not angular material. If you want to request changes to the behavior you can file an issue with https://github.com/angular/angular — You are receiving this because you were mentioned. Reply to this email directly, view it on GitHub <#4190 (comment)>, or mute the thread <https://github.com/notifications/unsubscribe-auth/ACv1DSsUuegP-lRLkdGOj5o1CoY8DEAUks5sGWh_gaJpZM4NDvLu> . Submitted state is based on the FormGroupDirective or the NgForm (depending on if you're using template- or model-driven forms). FormGroup does not hold submitted state. This behavior is in Angular core, not material. You are welcome to propose a change to the behavior, but that should be done in the angular core repository, not here. If you simply don't want .mat-input-invalid to depend at all on submitted state, you will be able to purpose #4750 for that once it lands. Any Update on this fix? @jplew an advantage of using (ngSubmit) on form is that the form is automatically submitted when you press Enter in a text field. You would need to do that manually. Actually this is still a bug only in material. It has nothing to do with resetting the submit state. In angular core i can put markAsPristine and markAsUntouched on a single formControl. The css classes get set correctly ignoring if it was submitted or not. The question is why put css class mat-form-field-invalid on it, when there is already ng-invalid. The "red-state" could be calculated like this: ng-invalid && ng-touched finish, it would work. Will the problem be solved in the next 1 - 2 releases? Since the problem already exists since 2017? it seems this is still an issue. the workaround from @willshowell worked for me, but had to go through some research to get this fixed. Thinking it could be fixed with alternatives already provided here, or at least better documented. @emadkheiralla, while that works for a 1 level structure, it won't work for nested controls. You would need to create a recursive function for that. It also is not recommended, see #4190 (comment).